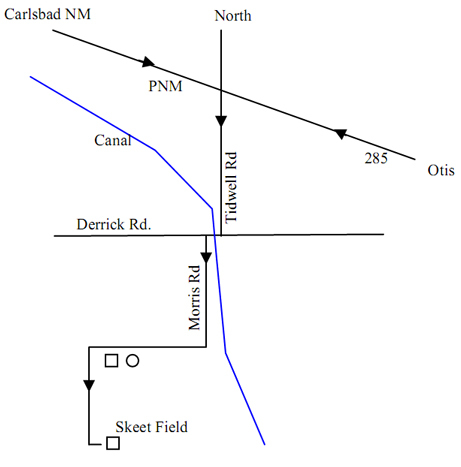 Across the Canal is located at E. Morris Road in Carlsbad, NM. At the Carlsbad South Y going to Loving travel approx 2.6 miles until you come to Tidwell Road. Turn Right on to Tidwell Road. Go down Tidwell for 1.6 miles until you come to Derrick Road. Make an immediate left onto Morris Road. Morris Road will turn into a dirt road, keep going over a cattle guard heading west up past a stucco house for 1.5 miles. After the house you will be going south for another ¼ mile. This is where ATC Shooting Sports is located.